An adder is a digital circuit that performs addition of numbers. In many computers and other kinds of processors adders are used in the arithmetic logic units or ALU. They are also used in other parts of the processor, where they are used to calculate addresses, table indices, increment and decrement operators, and similar operations. Although adders can be constructed for many number representations, such as binary-coded decimal or excess-3, the most common adders operate on binary numbers. In cases where two's complement or ones' complement is being used to represent negative numbers, it is trivial to modify an adder into an adder–subtractor. Other signed number representations require more logic around the basic adder. Half adder using NAND gates only. Logic diagram for a full adder. Full adder in action. A full adder gives the number of 1s in the input in binary representation. A full adder adds binary numbers and accounts for values carried in as well as out. A one-bit full-adder adds three one-bit numbers, often written as A, B, and Cin; A and B are the operands, and Cin is a bit carried in from the previous less-significant stage. The full adder is usually a component in a cascade of adders, which add 8, 16, 32, etc. bit binary numbers. The circuit produces a two-bit output. Output carry and sum typically represented by the signals Cout and S, where the sum equals 2Cout + S.
A full adder can be implemented in many different ways such as with a custom transistor-level circuit or composed of other gates. One example implementation is with S = A ⊕ B ⊕ Cin and Cout = (A ⋅ B) + (Cin ⋅ (A ⊕ B)). In this implementation, the final OR gate before the carry-out output may be replaced by an XOR gate without altering the resulting logic. Using only two types of gates is convenient if the circuit is being implemented using simple integrated circuit chips which contain only one gate type per chip. Decimal 4-digit ripple carry adder. FA = full adder, HA = half adder. 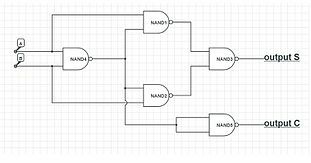 It is possible to create a logical circuit using multiple full adders to add N-bit numbers. Each full adder inputs a Cin, which is the Cout of the previous adder. This kind of adder is called a ripple-carry adder (RCA), since each carry bit "ripples" to the next full adder. Note that the first (and only the first) full adder may be replaced by a half adder (under the assumption that Cin = 0). A design with alternating carry polarities and optimized AND-OR-Invert gates can be about twice as fast. To reduce the computation time, engineers devised faster ways to add two binary numbers by using carry-lookahead adders (CLA). They work by creating two signals (P and G) for each bit position, based on whether a carry is propagated through from a less significant bit position (at least one input is a 1), generated in that bit position (both inputs are 1), or killed in that bit position (both inputs are 0). In most cases, P is simply the sum output of a half adder and G is the carry output of the same adder. After P and G are generated, the carries for every bit position are created. Some advanced carry-lookahead architectures are the Manchester carry chain, Brent–Kung adder (BKA), and the Kogge–Stone adder (KSA). Some other multi-bit adder architectures break the adder into blocks. It is possible to vary the length of these blocks based on the propagation delay of the circuits to optimize computation time. These block based adders include the carry-skip (or carry-bypass) adder which will determine P and G values for each block rather than each bit, and the carry-select adder which pre-generates the sum and carry values for either possible carry input (0 or 1) to the block, using multiplexers to select the appropriate result when the carry bit is known. By combining multiple carry-lookahead adders, even larger adders can be created. This can be used at multiple levels to make even larger adders. For example, the following adder is a 64-bit adder that uses four 16-bit CLAs with two levels of LCUs. Other adder designs include the carry-select adder, conditional sum adder, carry-skip adder, and carry-complete adder. If an adding circuit is to compute the sum of three or more numbers, it can be advantageous to not propagate the carry result. Instead, three-input adders are used, generating two results: a sum and a carry. The sum and the carry may be fed into two inputs of the subsequent 3-number adder without having to wait for propagation of a carry signal. After all stages of addition, however, a conventional adder (such as the ripple-carry or the lookahead) must be used to combine the final sum and carry results. 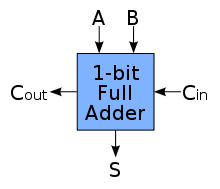 A full adder can be viewed as a 3:2 lossy compressor: it sums three one-bit inputs and returns the result as a single two-bit number; that is, it maps 8 input values to 4 output values. Thus, for example, a binary input of 101 results in an output of 1 + 0 + 1 = 10 (decimal number 2). The carry-out represents bit one of the result, while the sum represents bit zero. Likewise, a half adder can be used as a 2:2 lossy compressor, compressing four possible inputs into three possible outputs. Such compressors can be used to speed up the summation of three or more addends. If the addends are exactly three, the layout is known as the carry-save adder. If the addends are four or more, more than one layer of compressors is necessary, and there are various possible design for the circuit: the most common are Dadda and Wallace trees. This kind of circuit is most notably used in multipliers, which is why these circuits are also known as Dadda and Wallace multipliers. ^ Lancaster, Geoffrey A. (2004). Excel HSC Software Design and Development. Pascal Press. p. 180. ISBN 978-1-74125175-3. ^ Mano, M. Morris (1979). Digital Logic and Computer Design. Prentice-Hall. pp. 119–123. ISBN 978-0-13-214510-7. ^ Satpathy, Pinaki (2016). Design and Implementation of Carry Select Adder Using T-Spice. Anchor Academic Publishing. p. 22. ISBN 978-3-96067058-2. ^ Burgess, Neil (2011). Fast Ripple-Carry Adders in Standard-Cell CMOS VLSI. 20th IEEE Symposium on Computer Arithmetic. pp. 103–111. ^ Brent, Richard Peirce; Kung, Hsiang Te (March 1982). "A Regular Layout for Parallel Adders". IEEE Transactions on Computers. C-31 (3): 260–264. doi:10.1109/TC.1982.1675982. ISSN 0018-9340. ^ Kogge, Peter Michael; Stone, Harold S. (August 1973). "A Parallel Algorithm for the Efficient Solution of a General Class of Recurrence Equations". IEEE Transactions on Computers. C-22 (8): 786–793. doi:10.1109/TC.1973.5009159. ^ Reynders, Nele; Dehaene, Wim (2015). Written at Heverlee, Belgium. Ultra-Low-Voltage Design of Energy-Efficient Digital Circuits. Analog Circuits And Signal Processing (ACSP) (1 ed.). Cham, Switzerland: Springer International Publishing AG Switzerland. doi:10.1007/978-3-319-16136-5. ISBN 978-3-319-16135-8. ISSN 1872-082X. LCCN 2015935431. Liu, Tso-Kai; Hohulin, Keith R.; Shiau, Lih-Er; Muroga, Saburo (January 1974). "Optimal One-Bit Full-Adders with Different Types of Gates". IEEE Transactions on Computers. Bell Laboratories: IEEE. C-23 (1): 63–70. doi:10.1109/T-C.1974.223778. ISSN 0018-9340. Lai, Hung Chi; Muroga, Saburo (September 1979). "Minimum Binary Parallel Adders with NOR (NAND) Gates". IEEE Transactions on Computers. IEEE. C-28 (9): 648–659. doi:10.1109/TC.1979.1675433. Retrieved 2018-05-12. Mead, Carver; Conway, Lynn (1980) [December 1979]. Introduction to VLSI Systems (1 ed.). Reading, MA, USA: Addison-Wesley. ISBN 978-0-20104358-7. Retrieved 2018-05-12. Davio, Marc; Dechamps, Jean-Pierre; Thayse, André (1983). Digital Systems, with algorithm implementation (1 ed.). Philips Research Laboratory, Brussels, Belgium: John Wiley & Sons, a Wiley-Interscience Publication. ISBN 978-0-471-10413-1. LCCN 82-2710. Hardware algorithms for arithmetic modules, includes description of several adder layouts with figures. Interactive Full Adder Simulation (requires Java), Interactive Full Adder circuit constructed with Teahlab's online circuit simulator. Interactive Half Adder Simulation (requires Java), Half Adder circuit built with Teahlab's circuit simulator.